Genepax Hoax? Rush to Judgement? Genepax’s announcement of a fuel system powered by water has been generating some buzz (see my previous post on the announcement). To over simplify things for the layman (and I am one of them, so if there are errors, please educate me) the use of water as an energy source requires another source to force the separation of water molecules into hydrogen and oxygen. Genepax claims that their system uses a membrane electrode assembly (MEA), which contains a material that allows the necessary chemical reaction to convert water into an energy source. Some people have slammed Genepax’s invention as impossible since it defies the principles of physics, or as Mark Chu-Carroll calls it, “Perpetual Motion via Fuel Cell.” They say that there must be a hidden energy source operating Genepax’s system, such as batteries, and Genepax is orchestrating a complete fraud to lure gullible, science-illiterate venture capitalists to invest. But should we be so quick to dismiss whatever Genepax has to say? Science has long had a history of disagreeing what is possible or not. It was only fifty years ago did most physicists dismiss Hugh Everett’s PhD dissertation on parallel worlds. Today, many physicists have come to reexamine Everett’s work and the idea of parallel worlds is now part of modern astrophysics. Does it cost us anything to keep an open mind? Genepax is schedule to hold an English press conference soon where they will demonstrate their system to foreign media. During that demonstration, I think it would be fair for Genepax to allow someone to closely securitize and examine their prototype car and system to make sure there is not a hidden power source. If Genepax allows that, would this cause the naysayers to reexamine things? Stop the presses! Car runs on water! For reals! In an age where we hear about how global warming is going to potentially extinguish our species, I would have imagined that an emission-free car running purely on any type of water (sea water, rain water, toilet water, & even tea) would be front page news everywhere. After all, automobiles are responsible for a big chunk of carbon dioxide emissions in America and elsewhere. Japanese company, Genepax, has done such a feat. 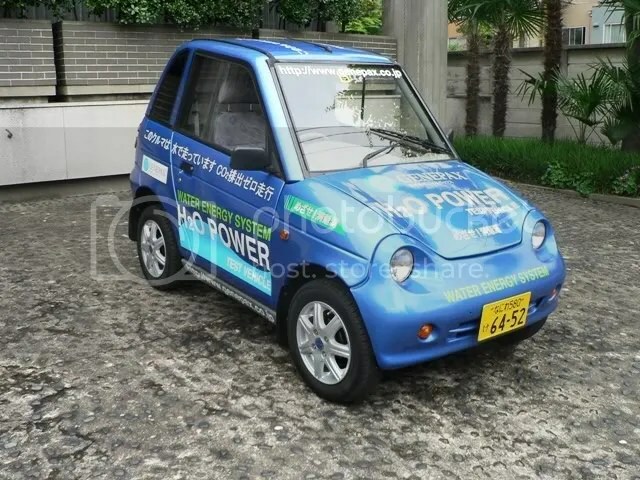 It introduced a new fuel cell system, running only on water and air, in a working prototype car that can travel up to 50 miles per hour. Since any water will do, refueling is no problem anywhere. In an age where a hydrogen Honda still costs a cool $1 million to produce, Genepax’s fuel cell system only costs $18,500 and is likely to fall below $5,000 with mass production. In addition to cars, Genepax envisions a future where homes can also be powered using water from their fuel cell systems. So where is the news coverage? There is no mention of this in the LA Times, NY Times, Washington Post, BBC, or CBC. I picked up the article from Tech-On, an English technology news website based out of Japan. Why isn’t this news in any of the major news outlets in the States and elsewhere? Should I just sit here and scratch my head baffled or start running around yelling conspiracy?!!?? A car that runs only on regular water is bad news for a lot of powerful folks, namely the oil companies. Even when petroleum runs out, Exxon Mobil and friends would love for you to continue to stop by their happy stations to pump in some nice hydrogen (and I’m sure they will come up with some reason to charge an exorbitant amount for it). But if your car ran purely on water from the faucet in your kitchen, a public bathroom (yes, gross), or even Evian if you are feeling extra snooty, what are the likes of Exxon Mobil and friends going to do? That gives you some food for thought on how companies like Shell are already building hydrogen refueling stations in California and how the automobile manufacturers are also pushing hydrogen cars as the end-all-be-all solution. My gut always told me that oil executives and auto executives play golf and drink scotch together at the same country club, but where do the news people fall in? Once again, why isn’t stuff like a car that runs on water big news when the Olsen twins makes news by eating an entire sandwich? (Edit: Please read my followup post in response to many people’s comments that Genepax’s car is just a hoax). The Big Bad Wolf in Sheep’s Clothing?